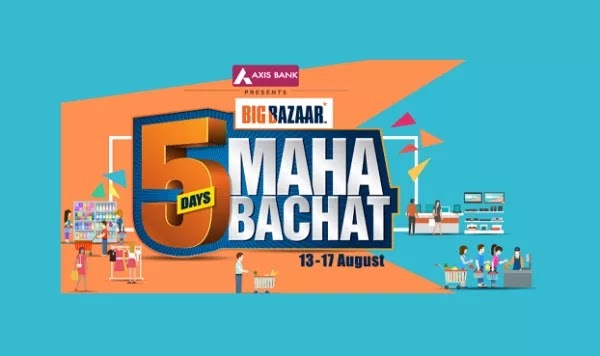 Big Bazaar is back on public demand with "Big Bazaar Maha Bachat Sale" 13th August to 17th August. Shop at huge discount + Cashback offers from Mobikwik / Paytm / Axis Bank. Maximize your Savings in just 5 days. 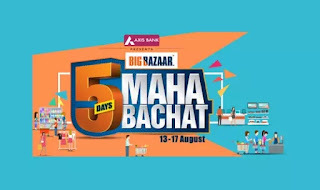 How to buy From Big Bazaar Maha Bachat Sale? • Once Payment is done, You Get Instant Cashback . - Mobikwik -Get Flat Rs.200 cashback on transaction above Rs.3000. - Extra 10% off with Axis Bank Cards.